On May 23 United States Naval Academy graduated 1047 midshipmen under an unusually cool Memorial Day weekend. 764 were commissioned as Navy Ensigns, 264 as Marine Corps 2nd Lieutenants and 3 commissioned as a 2nd Lieutenant in the Air Force. There were 16 foreign national students graduating from Belize, Georgia, Guatemala, Korea, Lebanon, Montenegro, Panama, Philippines, Poland, Singapore, South Africa, Taiwan and Tunisia. The top graduate is Christopher Dean Galvin of Austin, Texas who was a mechanical engineering major. He will be commissioned as a Navy Ensign and will train as a submariner. This is the 163rd traditional graduation ceremony. Since 1845, approximately 79,900 midshipmen have graduated from the Naval Academy. 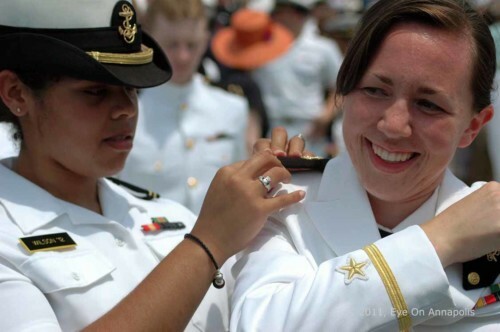 Since 1980, more than 4100 women including the class of 2013 have graduated from the United States Naval Academy. Pres. Barack Obama addressed the graduates this morning at about 1020am. The president was joined on the rostrum by Maryland Gov. Martin O’Malley, Secretary of the Navy Ray Mabus, Vice Adm. Michael Miller Superintendent of the Naval Academy, and Capt. Bob Clark Commandant of midshipmen among other military and political officials. Due to the federal government sequestration, there was no fly over by any military aircraft at today’s ceremony. Security was tight in the stadium with everyone having to pass through metal detectors and having her belongings searched by Secret Service agents.